It is a town in decline, with less travelers visiting since the haunting of the barrow began. Some of the residents fear for the town's survival as many of the towns people have either left for Riften or want to move away. 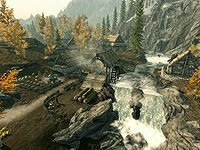 Pilgrims and travelers often pass through the town on their way up the 7000 steps to High Hrothgar. Esta página foi modificada pela última vez à(s) 21h54min de 4 de setembro de 2015.